Click pin for information about each victim. Pins are color coded by year. 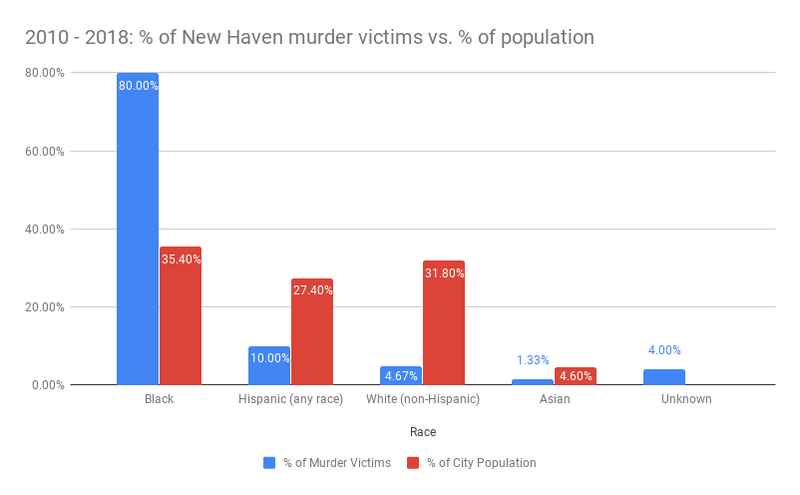 From 2010 to 2018, there were a total of 150 homicides in New Haven. From a high of 34 murders in 2011, it has quickly declined to an average of 13 murders per year, 2012 and onwards. In 2010, there was a victim who remains unidentified. He was estimated to be between 20 and 30 and is not counted in the graph below. People in the 21-30 age group are almost twice as likely to be murder victims than the next highest age groups (11-20 & 31-40). The sole Lebanese victim was counted as white and both Indian victims are counted as Asian. Between 2010 and 2018, there were 139 male victims versus 11 females. Between 2010 and 2018, men are almost 13 times more likely to be murdered than women.